Sweet Sincerity: SHOPPING, SHOPPING, SHOPPING!!!! Need I say more? SHOPPING, SHOPPING, SHOPPING!!!! Need I say more? So today was an interesting shopping trip. 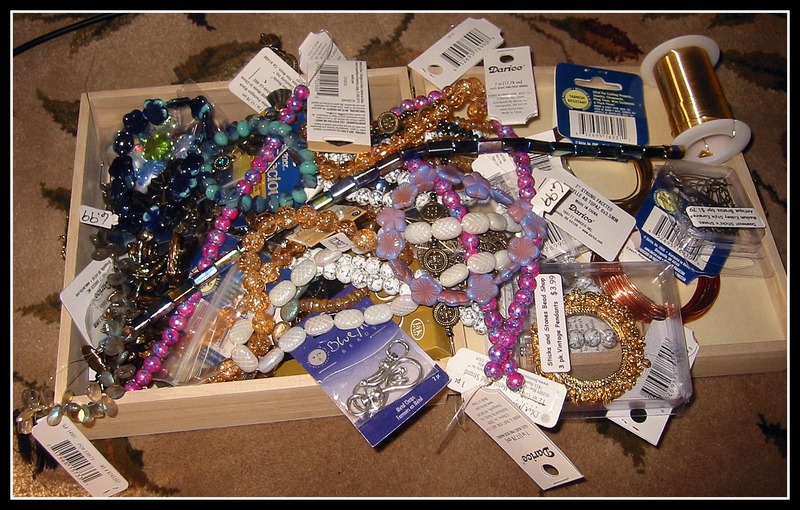 I hit two of those local chain craft stores because I had fantastical coupons there. I also went to my favorite bead shop, Downeast Sticks'n Stones. Needless to say, I came home with a bundle of goodies. One thing I have learned is, never buy from a chain store unless you have a discount coupon or there is something on sale. It really saves money in the end, that way your products can be more affordable to your clientele. However, the only drawback to that line of thinking is when there is a sale, or I do have a fabulous coupon, it's like skinny girls eating cupcakes! You know what I mean :) I come home with crazy loads of loot on one day, and sometimes there is sticker shock and buyers remorse afterward. Not today though, because I got some GREAT stuff. See for yourself. 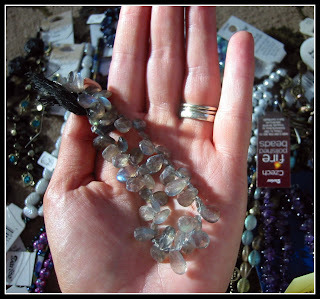 What am I absolutely most excited about from my stash of crazy, awesome beads? The gorgeous labradorite that I bought from Downeast Sticks'n Stones. 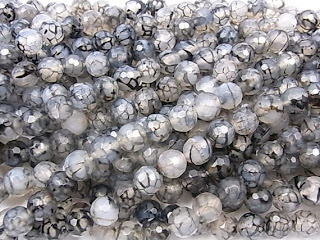 I got some other great stuff there too, but these little faceted briolettes are my favorite! Their glistening blue, grey shimmer is mesmerizing. Not sure what I'm going to make with them yet, but I'm sure they be the highlight of the piece. Check them out! 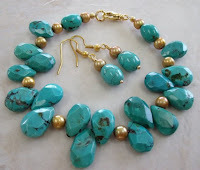 Gemstones make my mouth water! Is that weird? Yeah...it probably is. 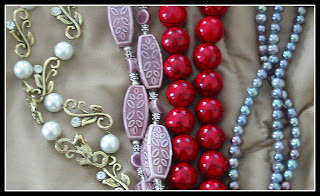 Okay, Not that I haven't plugged my favorite bead shop enough, but here's a link to my blog post with their website and facebook fan page http://sweetsincerityjewelry.blogspot.com/2010/12/today-is-shopping-and-shipping-day-and.html. I really just love that store! 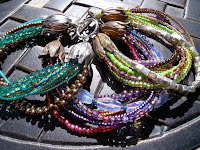 You can buy beads anywhere, but the quality of materials and the varied selection is phenomenal. Not to mention that the customer service is far superior to any chain store (i.e. 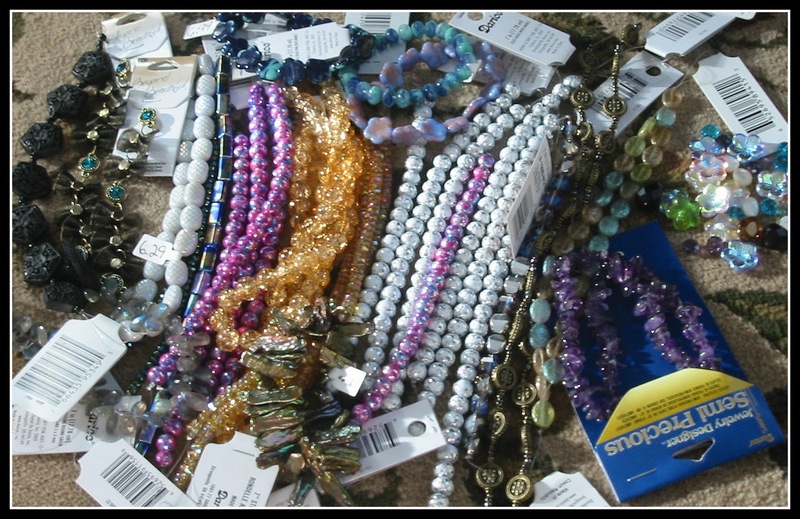 I don't have to spend 25 minutes of my day reasoning with a manager about getting a discount on clearly defective beads) It was evident today they are very much appreciated in the community as well, by the excited hustle and bustle going on in their shop. Also, the owner showed me a recent article in the Bangor Daily News featuring their store and new shop location (they just moved a little while ago). Here's the link to the fantastic article, just click on the adorable picture of the mother and child shopping in their store. Yes! I agree re: never shopping in big box craft stores unless you have a coupon. 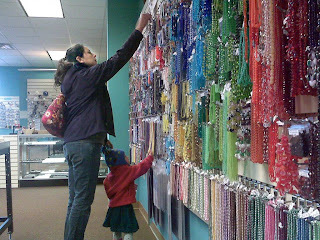 Although I'm a little farther south than you I've had the same experience - above and beyond customer service at the Beadin' Path in Freeport, and good times although not as much experience at Caravan Beads in Portland. I'll be darned, though, if I'm going to pay $5.99 a strand in South Portland if I can hold out a couple days and pay with a 40% off coupon! Congrats on all your new swag. Just updated my blog theme! Trying to make it a little less journal-y and a little more user friendly. Tell me what you think!